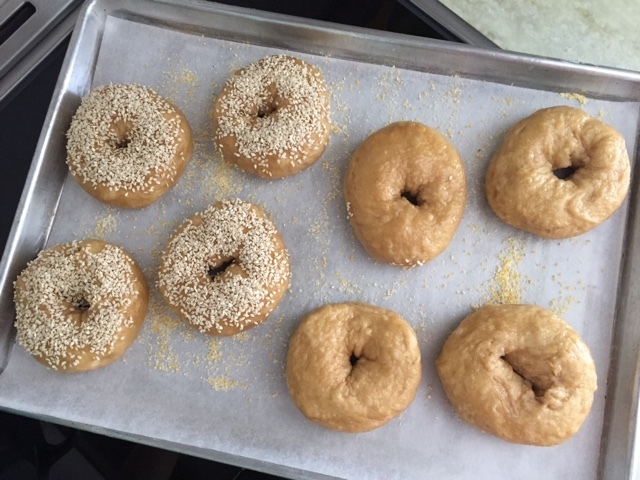 After teaching several bagel classes recently I was gung-ho to make my own New York style bagels at home. Chewy, molasses-y and yummy. The process is pretty straight forward. 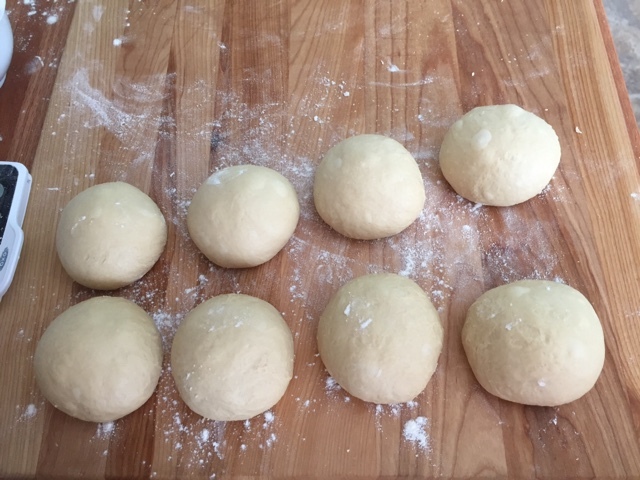 Make the dough, let it rise, divide the dough, shape the bagels, let 'em rest a bit, boil 'em, egg wash and top 'em, then bake them in the oven for the finale. All in an afternoon's work. 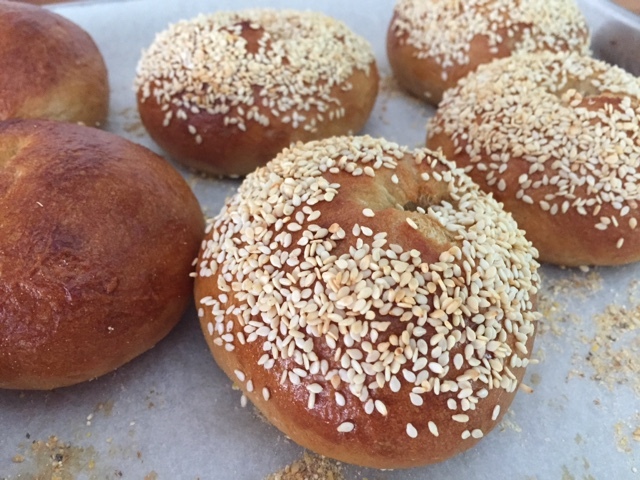 Following the Sur La Table recipe for 8 bagels, combine 500 g bread flour and 1 tablespoon salt in the bowl of a stand mixer fitted with the dough hook. Mix briefly to combine. In a separate bowl place 1.5 cups warm water and sprinkle in 2 teaspoons active dry yeast and 1 tablespoon sugar. Let stand for 5 minutes until the yeast starts to foam. Add in 2 tablespoons barley malt syrup and stir to dissolve (see note). NOTE: since I didn't have barley malt syrup on hand I substituted 4 teaspoons molasses at 2/3 the quantity. With the mixer on low add the yeast mixture to the flour/salt and mix to combine. 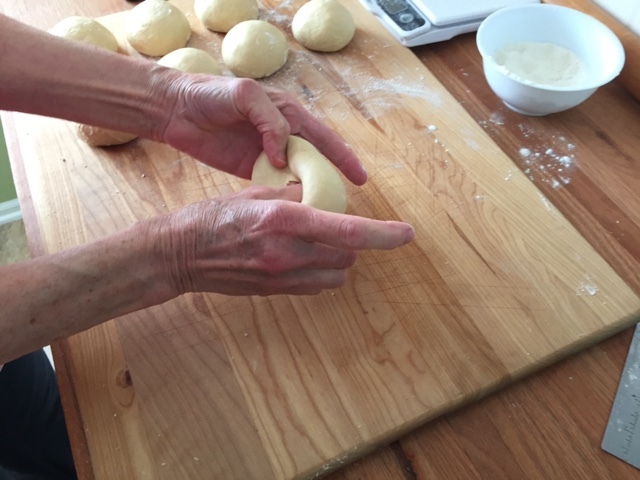 Then knead the dough on medium speed for 6-8 minutes until smooth and elastic. The dough is a bit sticky. 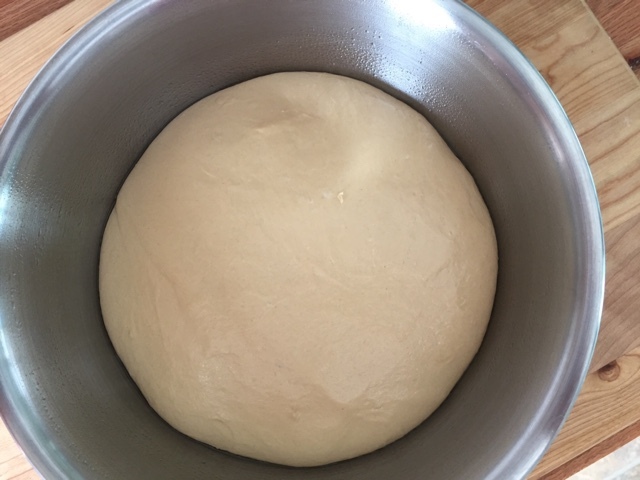 Place the dough in a lightly oiled bowl and allow it to rise in a warm spot for about an hour (until doubled). Now comes the fun part! Shaping - yes! Before you start, get the oven heating to 425ºF convection (450 conventional). 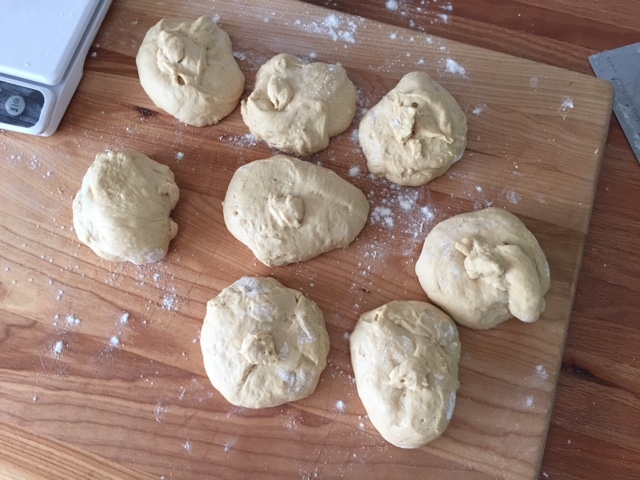 Turn the dough out onto a lightly floured surface, deflate lightly and divide with a bench scraper into 8 pieces. Shape each piece into a smooth, tight ball. 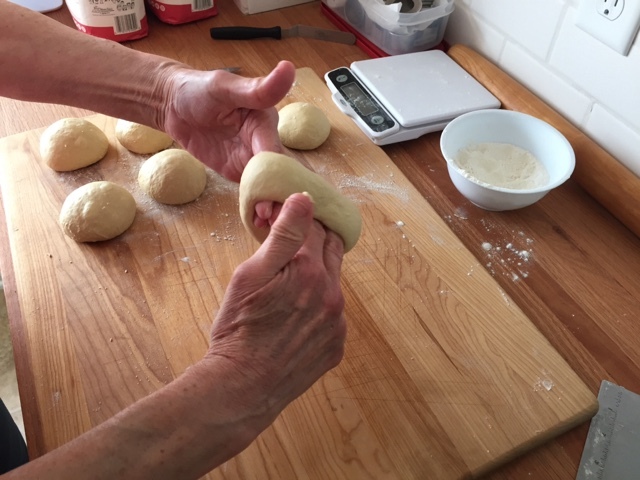 This step is the most fun, especially once you get the feel of the dough as it rounds up and develop the muscle memory in your hand to make it happen. You gotta be there to understand it. 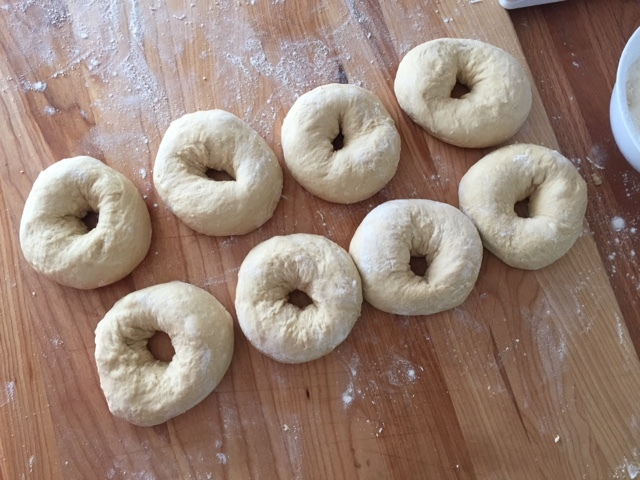 OK, so maybe THIS step is really the most fun - forming the bagel. First stick your thumb through the center. Once the hole is formed, place your index and middle fingers through it and rotate to stretch out the hole to about 2 inches. 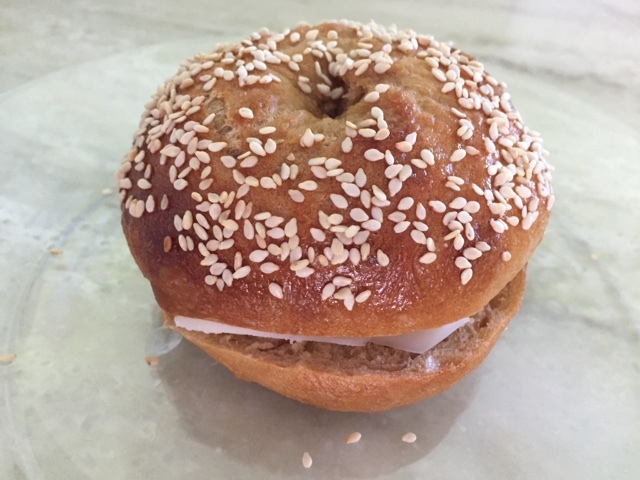 This is just one of the ways to shape a bagel. The other involves rolling each piece into a snake, bringing the ends together in an overlapping fashion, then putting your fingers through the center, palm down, with the overlap on the work surface and rolling to seal. 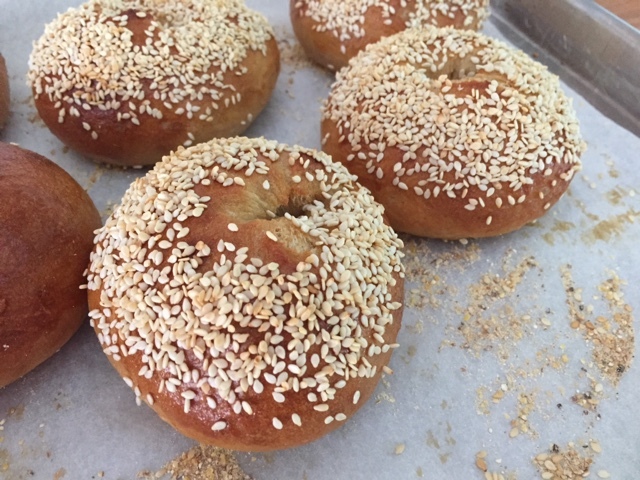 Once the bagels are shaped, place them on a lightly floured surface, cover with a damp cloth and let them rest about 10 minutes. Meanwhile, bring about 4 quarts of water to a boil, adding about 3 tablespoons barley malt syrup (or in my case, about 2 tablespoons molasses). 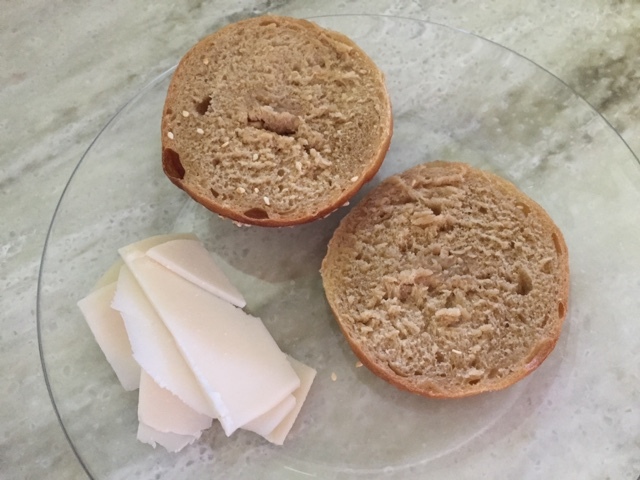 Drop the shaped and rested bagels into the boiling water and boil for a minute on each side. Lift them out with a slotted spoon and place on a grid to drip a bit, then brush with egg wash and sprinkle with topping(s) of choice. I chose sesame seeds for some and left the rest plain at Steve's request. Have a sheet pan ready lined with parchment and sprinkled with cornmeal. Now pop 'em into the oven and bake for about 20 minutes until nicely browned. ATTENTION! Don't open the oven for the first 10 minutes. 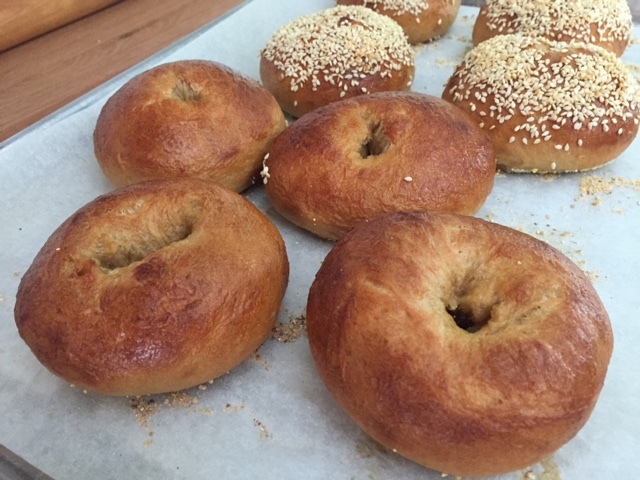 The initial steam produced by the wet bagels as they go into the hot oven contributes to the crusty exterior. Plus I'm told that if you open the oven too soon, your bagels may deflate a bit. Oh no! But DO rotate your pan after the first 10 minutes to get a nice even bake. It's a rule I follow regularly, no matter what I'm baking. Let these babies cool, then slice right in and enjoy. I decided for a simple cheddar cheese on mine. The chew, crumb and molasses essence of this was soooo good. Yes indeed. 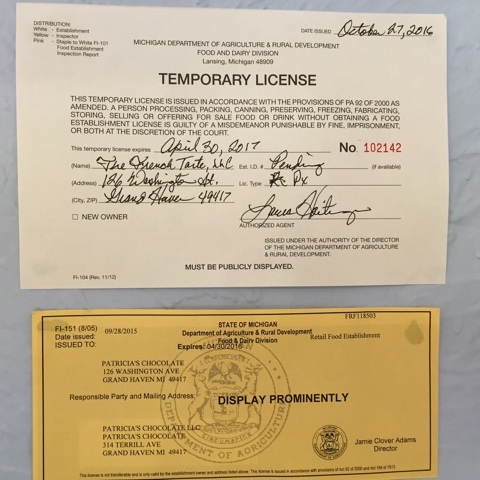 This past week The French Tarte became licensed to work out of the kitchen at Patricia's Chocolate in Grand Haven, Michigan. Hooray! What does this mean you might ask? Well to start out I'll be baking and offering my tasty all butter shortbread in Patty's shop, accepting orders for shortbread gift boxes and developing a schedule of travel from GR to GH to dovetail with my teaching schedule at Sur La Table here in GR. Taking it step by step. In the meantime I wanted to share with you some of things I've been making in recent months. 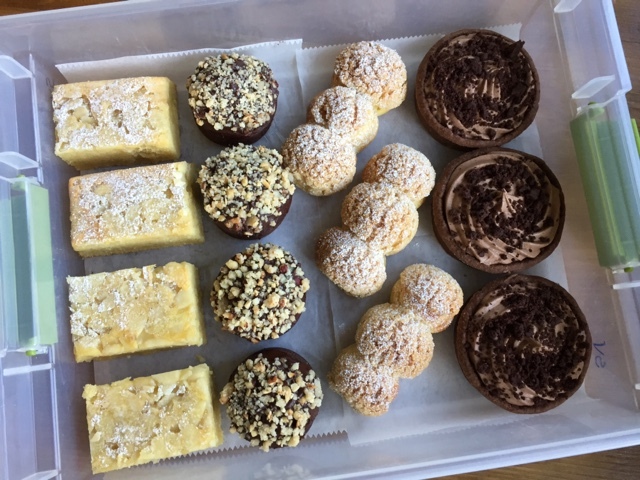 In early August, as I birthday present to myself, I baked an assortment of goodies (from left to right): pavé aux amandes, cocoa hazelnut financiers, bubble eclairs with raspberry currant cream (Yum!) and chocolate milkshake tarts. 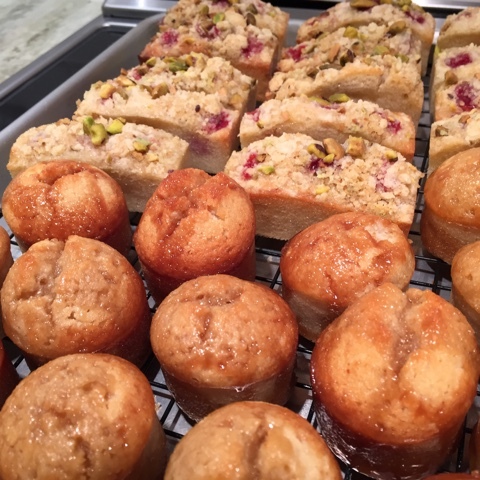 By now many of you know my attraction to financiers and tarts. What can I say? I just can't help it! 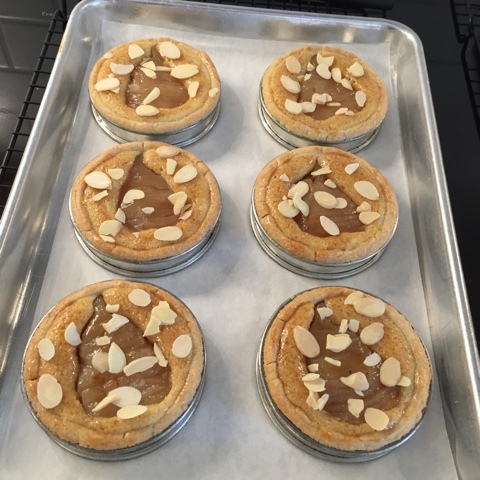 Once we returned from our trip to France in early October, I've been back in the kitchen doing this and that as well as trying some new shortbread flavors (how about coffee cardamom, oatmeal ginger or coconut lime?!). My baking activities often seem to revolve around what I happen to have in the fridge - some of my lightly spiced poached pears being just one example. What better than a batch of financier batter to create pear-caramel and raspberry-pistachio crumble versions for our freezer. The pears also encouraged me to make some individual versions of tarte bourdaloue using the recipe that I had brought back from Le Notre in Paris. Of course I simply can't forget the household favorite (hint, hint - guess what Steve loves? 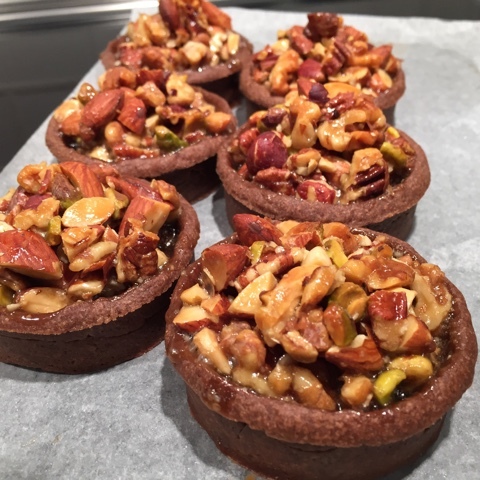 ), the quintessential caramel nut tart. This go around I used some chocolate tart dough that had been waiting in the freezer for that very thing. Chock full-o-nuts, oh-so-delicious and always a hit. 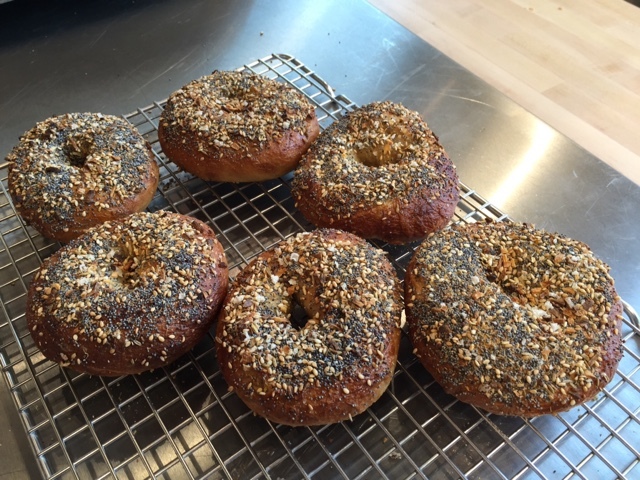 And for something just a little different - bagels! 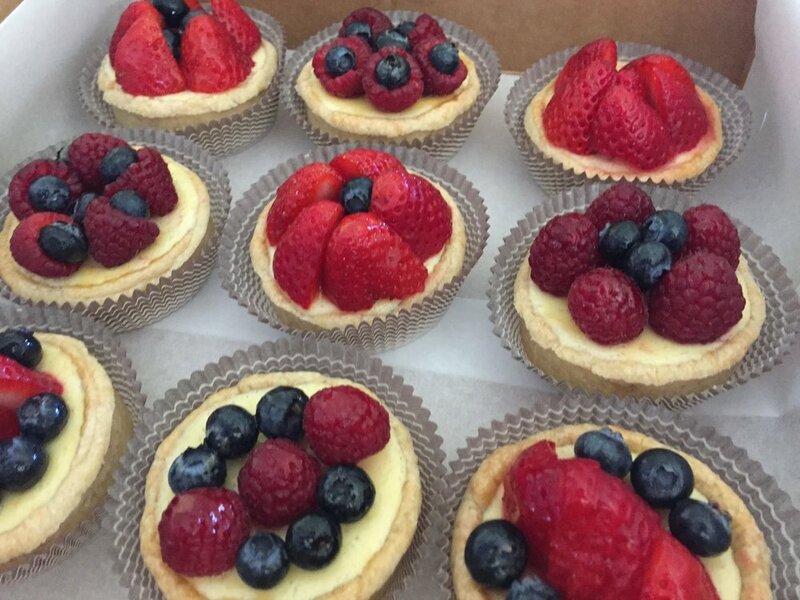 These were from a class I taught at Sur La Table where the results were stupendous. Chewy, not tough, great depth of flavor and definitely a make-again recipe. 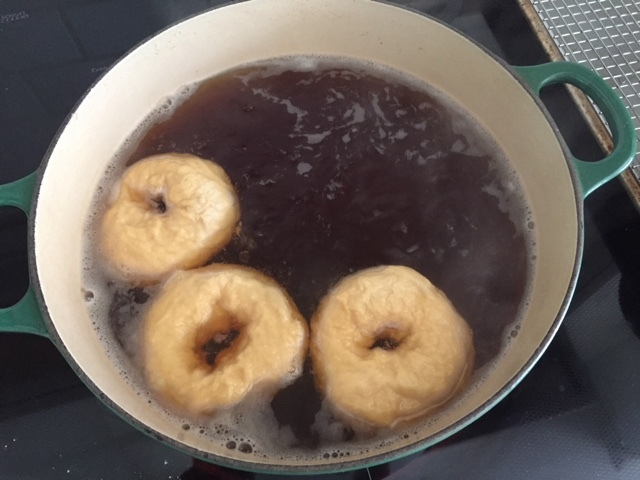 These are the "everything" version, the deeply browned exterior being due to molasses in the dough as well as some molasses in the bagel boiling water. Yup! And so the adventures continue. Stay tuned.